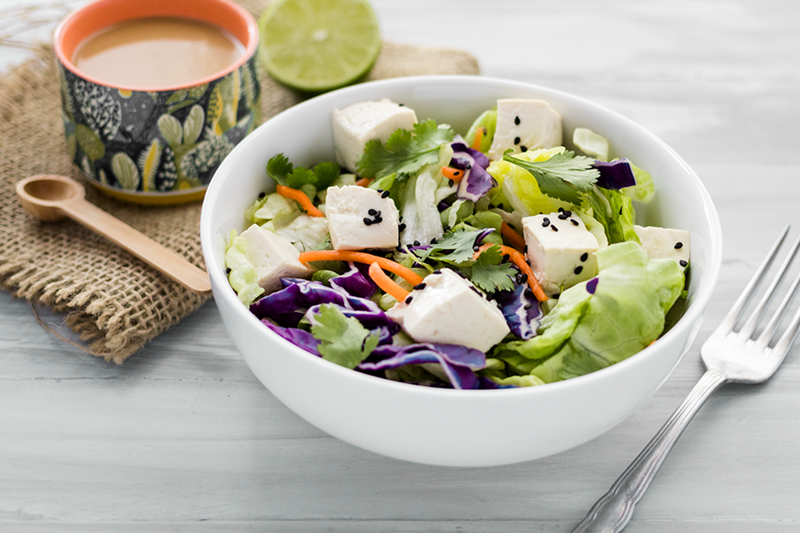 This vegan and gluten-free Thai salad with creamy peanut dressing is pure refreshment. 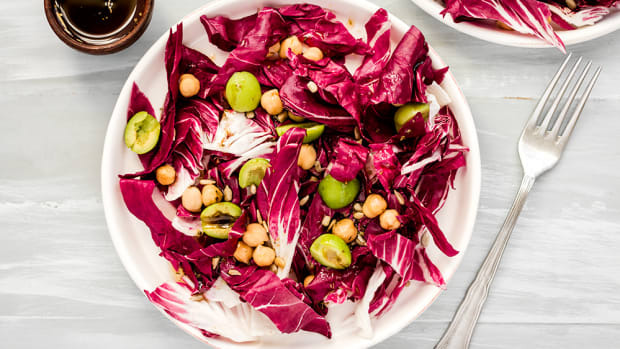 Healthy yet flavorful, this salad will satisfy you on warm days with its cooling flavors. The peanut dressing makes the salad just a tad indulgent, perfect to prove that salad doesn’t have to be boring. While there are many varieties of Thai salads ranging from papaya to cucumber-based, a leafy salad with peanut dressing is a tried and true favorite. This particular Thai salad uniquely uses butter leaf lettuce as opposed to romaine since it has a fresher and lighter taste. The key to making a healthy Thai salad is eliminating cholesterol-laden eggs and any heavy ingredients in the peanut dressing. 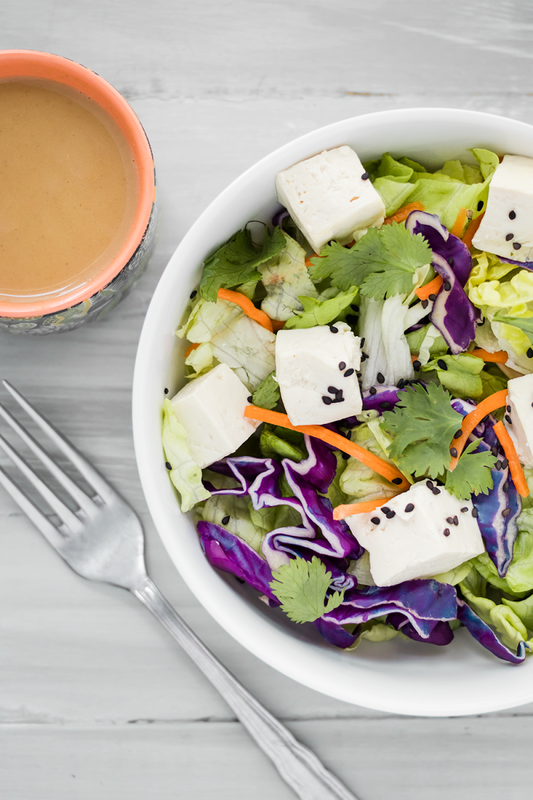 Steamed tofu adds protein and eliminates cholesterol that would normally be present from a hard boiled egg. Just one serving of this salad contains more than 15 grams of protein proving plant-based is protein-rich. 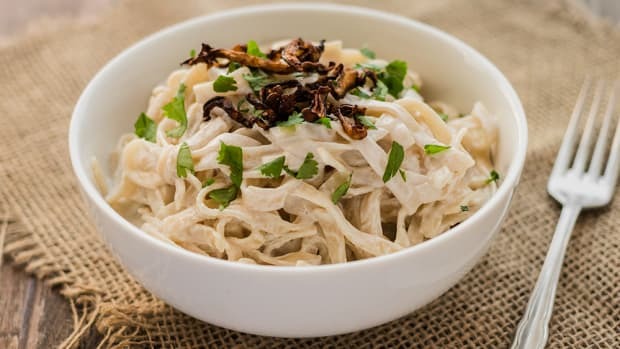 Low fat coconut milk and organic, natural peanut butter mix together to form a creamy yet light dressing. Make sure you choose a peanut butter that only contains peanuts in the ingredient label. Conventional peanut butter is often filled with unnecessary artificial ingredients, oils, sweeteners, and flavors. 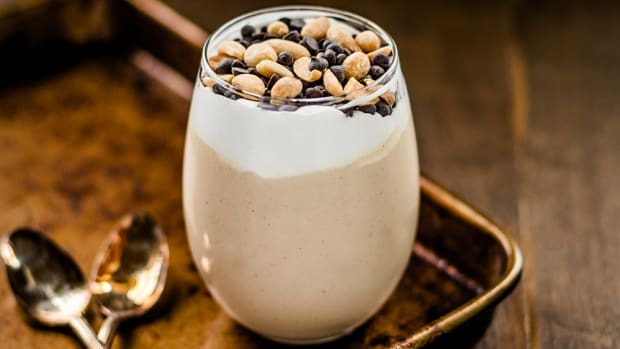 While peanut butter and coconut milk are high in fat, they contain healthy fats that are beneficial when eaten in moderation. Peanuts are regarded as heart healthy due to their monounsaturated fat content. Coconut, on the other hand, has medium fatty chain acids which may help to lower cholesterol and blood pressure. While butter leaf lettuce is extremely delicious and refreshing in this salad, you can also substitute it with romaine lettuce. The flavor and texture will be similar. 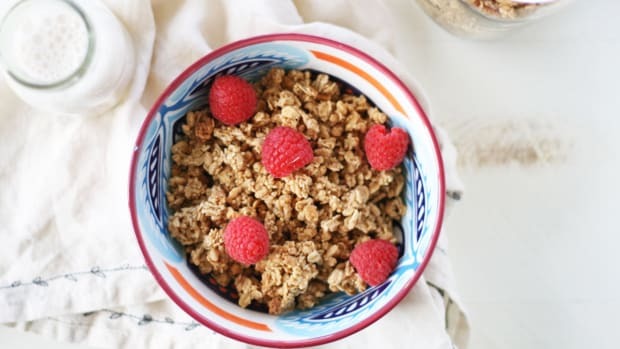 Also, if you have a peanut allergy or avoid peanut butter for dietary or health reasons, you can substitute another nut butter such as almond or sunflower seed. This salad can serve two as an entree or four as a side. Create a gourmet Thai three-course meal by serving it alongside this vegan Thai curry as the entree and mango with sticky rice for dessert. Cut tofu into two-inch cubes. Add enough water to a pot to reach the bottom of a steamer basket. Add tofu to the basket and steam for eight minutes. Transfer steamed tofu to a bowl and chill in the refrigerator for ten minutes. Add coconut milk, peanut butter, tamari, and maple syrup to a small sauce pan over medium heat. Whisk until well combined. Let come to a slow boil and then reduce heat to low. Simmer for five minutes. Remove sauce from heat and add sesame oil and lime juice. Transfer to an airtight container and let chill in the refrigerator for ten minutes. Meanwhile, add butter leaf lettuce, cabbage, and carrots to a large bowl. Toss until well combined. Gently fold in the steamed tofu. Add as much peanut dressing as desired and toss. Serve immediately and enjoy! 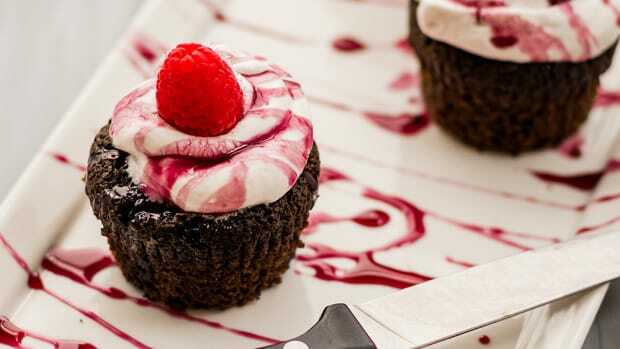 Bloody Halloween Cupcakes: Vegan and Gluten-Free! 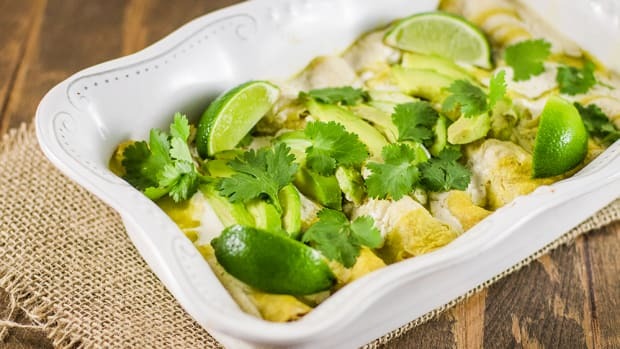 Vegan Enchiladas: So Good You'll Come Back For Seconds (and Thirds)! 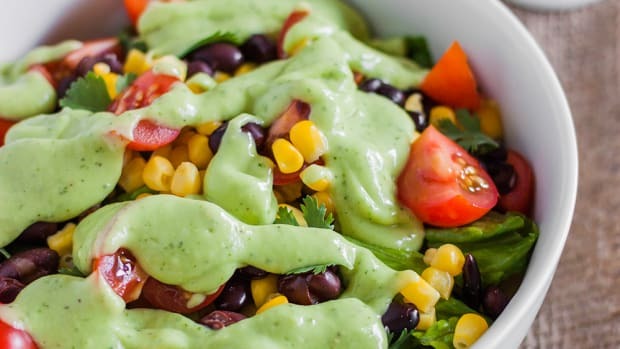 Black Bean and Corn Salad Recipe: The Most Satisfying Salad Ever! 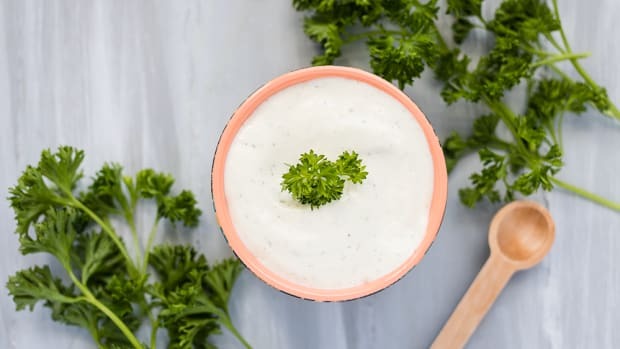 Homemade Vegan Ranch Dressing: Deliciously Dairy-Free and Ultra Creamy!